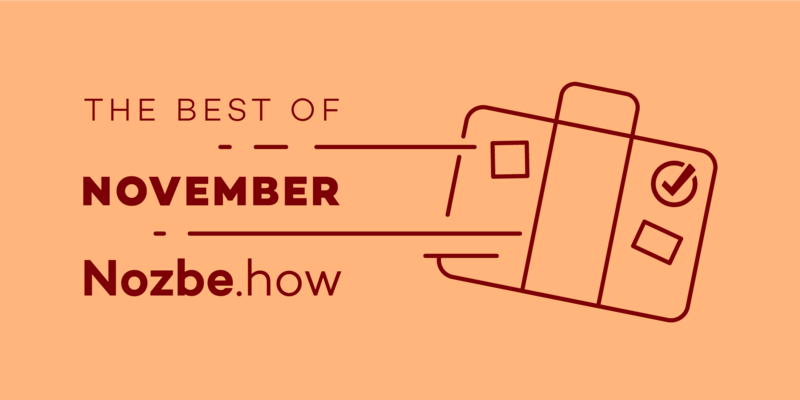 Why Black Friday/Thanksgiving weekend sale is the perfect time for Nozbe users to start getting organized? It’s all about timing. The Thanksgiving weekend is the last weekend of November so if you choose to upgrade to Nozbe PRO now you have December to actually sum up your year and prepare for a great next year. You have a whole month to get to know our tool, get all of our apps and start getting organized. Start putting all of your tasks and ideas to your inbox, start organizing tasks into projects, start creating your first categories… Most of all, start forming new habits around your new productivity system. Organizing this Thanksgiving sale at this time of year, we’re “convincing” you to commit to Nozbe for a year by offering you a great deal and this way we know you’ll really get your stuff organized. Maybe you’ll even get your team on board. For sure you’ll get your productivity rolling. Guaranteed! And if after a month you somehow don’t find our tool good fit for you (crazy idea, I know…), we’ll refund you all the money. No hard feelings. We only want really happy and productive customers. One year of Nozbe development to prove we care. And keep caring! Having our sale at the end of November gives us a chance to really show you what we’ve been doing all this year. The new Nozbe 2.6 with Nozbe.how shared templates, a new version of Nozbe almost every month, faster apps for Android and iOS, as well as great new apps for new platforms like Apple Watch or Windows Phone. But it’s more than that! Because you’ve taken advantage of our offer, you’ll automatically receive all the updates in the next year! Including Nozbe 3.0 coming in the Spring! We’ll keep pushing and updating our apps every month thus making you even more productive month after month and contributing on our end to make this next year your best ever! And these updates will cost you nothing extra! They’re all included because you took advantage of our sale and are committed to Nozbe and we are committed to you! Thanksgiving sale is a true win-win so let’s keep winning! It’s a win for you because you get a chance to really get organized with the best productivity tool and it’s a win for us, because we feel you appreciate all of the hard work we’ve put and keep putting into Nozbe and into making your life more organized! That’s why me and my entire team is so excited about this sale! And seeing people like you “voting with your wallet” for our productivity solution (sometimes even 3 new orders in 10 seconds, just like on the picture above! ), makes us even more excited to serve you even better next year and for the years to come. We’re close to 9 years running Nozbe and it still feels we’re just getting started! Thanks for being a part of Nozbe community! You rock!